The article „Speaking (drawing and writing) with different voices” is a reflection on urban design and the societal boundaries of the architect’s profession. Moreover, it explains the methodological foundation of our Re-tracing Home workshop series. T+U editorial agenda pursues self-expression and architectural intelligence by disclosing the artistry of design process. The issued articles intertwine the angles of architecture, landscape design and urban planning with the perspectives of science and art. 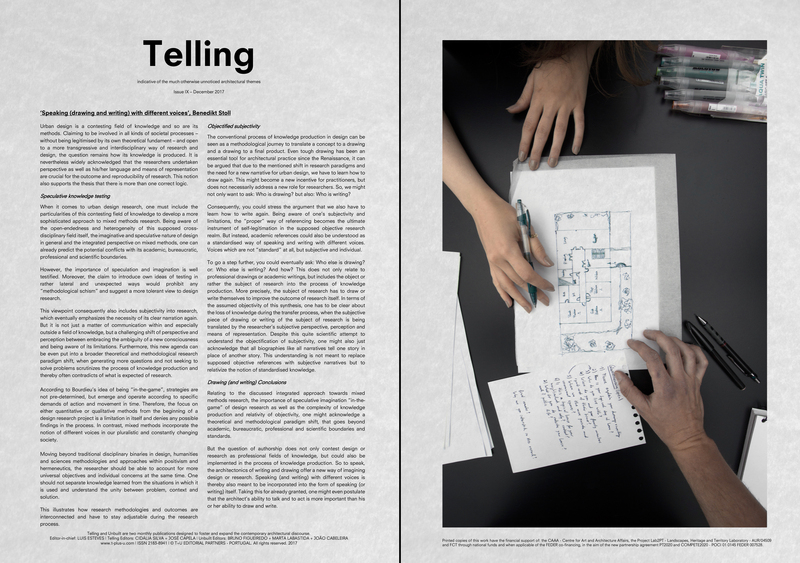 Telling proposes a multidisciplinary approach to specific architectural themes. Unbuilt centres its reflection in unvisited and never raised architectural projects. Printed copies of T+U are available in the Schools of Architecture of Guimarães and Porto, Portugal.